In the Brilliant Arlequino Flying Tourbillon timepiece, Jacob & Co. poetically merges the exceptional gem-setting artistry with spectacular high horology. This model is a daring, imaginative and enticingly feminine timepiece that echoes the richly coloured, chequered costume of a harlequin. 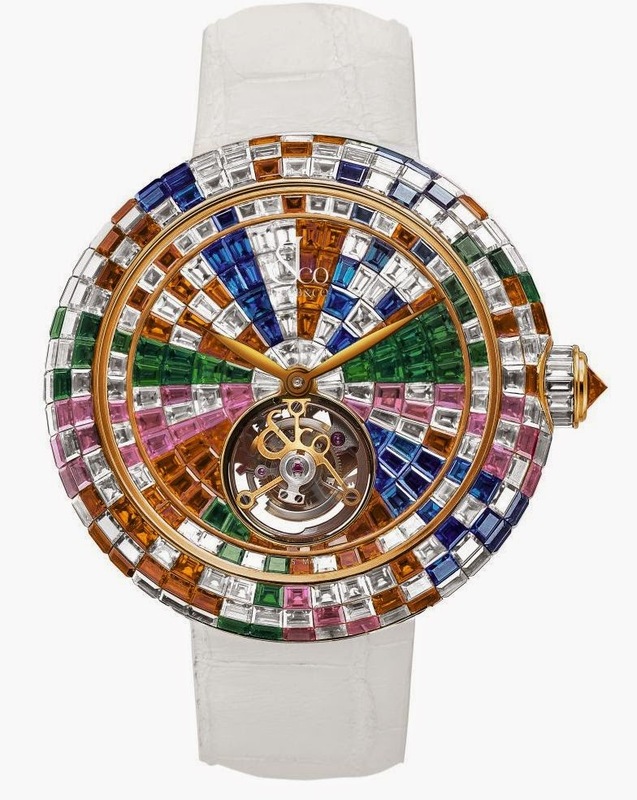 Produced in a limited edition of just 18 watches, and available in 18K white, rose or yellow gold versions, this sparkling and colourful timepiece is adorned with 205 vibrant, precious gemstones extending across its dial, bezel, crown and clasp. The flying tourbillon, constructed to appear as if it is floating above the dial of the watch, is a statement of the passion for extraordinary craftsmanship which lies at the heart of Jacob & Co. atelier. The setting combinations of gemstones, which each have different levels of resistance to pressure is a mission that can only be undertaken by a master craftsperson with extensive experience. 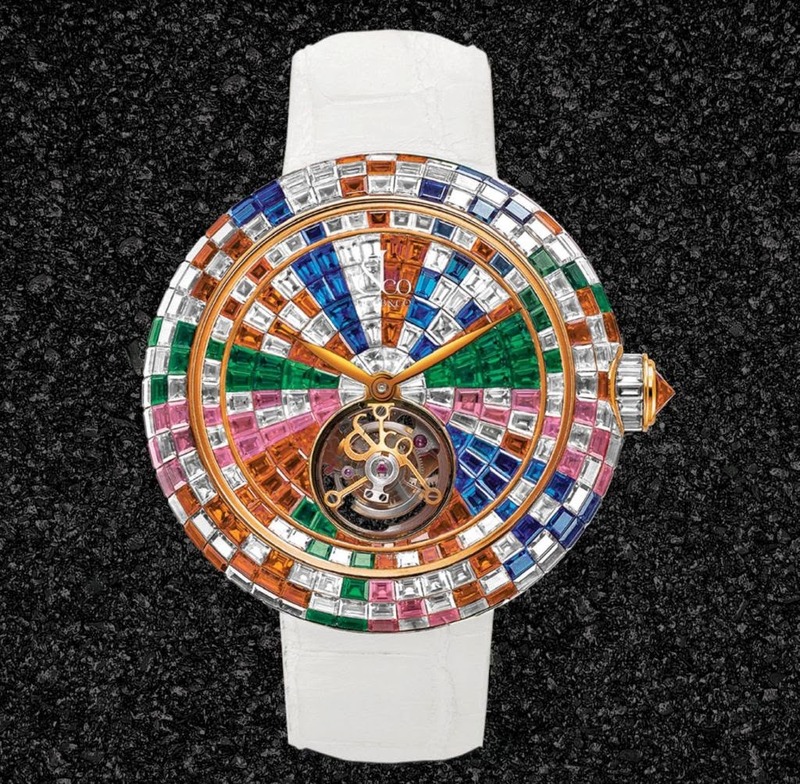 Like the original harlequins known for their physical agility on stage, the gem setters in the Jacob & Co. Geneva, Switzerland-atelier working on the Brilliant Arlequino watches had to constantly adapt their techniques to meet the specific demands of every gemstone, one by one – a task that requires patience, knowledge and agile, dexterous hands. The invisible setting of the baguette diamonds, which leaves no visible precious metal in between each gemstone, forms part of a carefully constructed design that reveals just the rose gold of the crown, topped with a rose cut yellow sapphire. Adorned with sparkling white diamonds and pink, blue, green and orange sapphires, the Jacob & Co. Brilliant Flying Tourbillon is also available in fully pave, single-gemstone versions in a choice of ruby, blue sapphire, pink sapphire or orange sapphire. Manually wound Jacob & Co. Caliber JCBM01, 29 jewels, diameter 34.10mm, total height 6mm, 206 components; one-minute flying tourbillon; frequency: 21,600 vib/h (3 Hz); anti shock, titanium balance with gold timing screw, 100-hour power reserve. Finishing: circular satin-brushed “Jacob & Co.” upper bridge of the tourbillon cage; Bridges: satin-finished, hand-polished angles, drawn-finished flanks. Traited bridges on the back; mirror-polished ornamental plate with circular satin finished black gold disc with engraved and white-lacquered Jacob & Co. logo. Alligator with 18K white, rose or yellow gold tang buckle set with 24 baguette white diamonds and multi-color sapphires, carat weight available upon request.